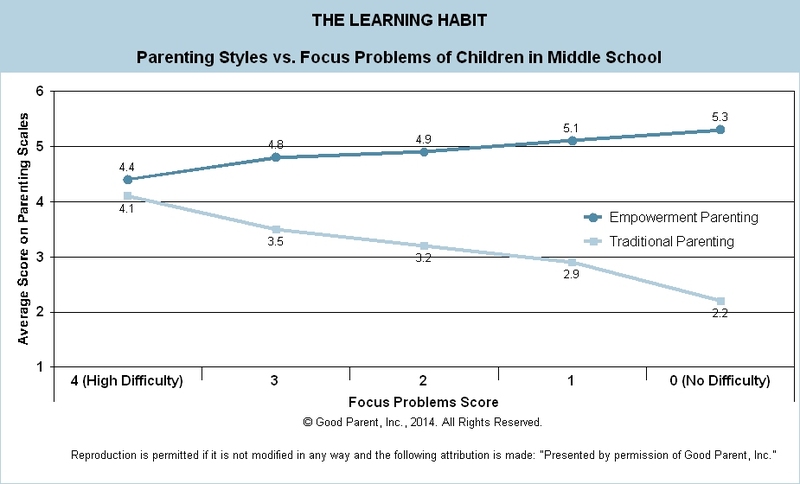 Parenting Styles vs Focus - Good Parent Inc. 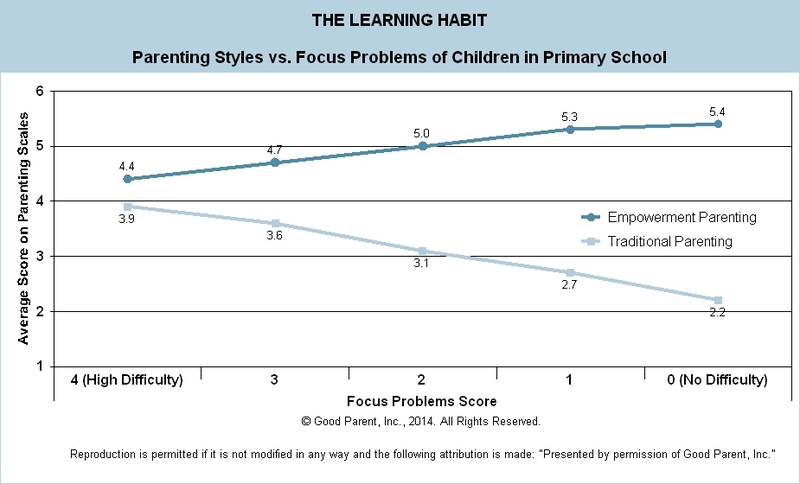 In the Learning Habit Study we examined Parenting Styles and Emotional Problems. Parenting Styles were broken down into two categories. Traditional Parenting places emphasis on correcting or punishing unwanted behavior. It was also characterized by reduced communication between parents and with the child. Empowerment Parenting included a productive flow of communication among parents as well as with the child and a measure of confidence in the child’s capacity to make appropriate choices. These Parenting Styles were compared against Focus Problems, which examined attention, impulsiveness, and the ability of the child to stay on task. We limited our examination of Focus Problems to primary and middle school youth. Across both grade levels, the higher the rate of Traditional Parenting techniques used by the parent, the higher the child’s Focus Problems score. Conversely, the higher the rate of Empowerment Parenting techniques used by the parent, the lower the child’s Focus Problems score. Traditional Parenting styles tend to be more punitive and restrictive and may foster insecurities in the child resulting in impulsiveness and limited attention. Parenting styles appear to have a significant impact on a child’s ability to focus. Traditional Parenting styles may contribute to focus impairment as well as have physical effects such as trouble falling asleep, which can also contribute to Focus Problems. Through Empowerment Parenting, which seeks more positive reinforcement, children tended to have better self-control, more focus, and less sleep onset latency. In brief, parents who indicated they practiced more Empowerment Parenting had children with higher rates of healthy childhood outcomes.